Sunset condos for sale are two-three story ski homes with modest front facades, and easy access to skiing out the backdoor. The Snowflake Lift is just a block uphill from the Sunset Condos, and the free town shuttle stops outside. Because of this convenient location and the versatile style of the units, these condos have the potential to generate short-term rental income. There is a common parking area but not individual garages. 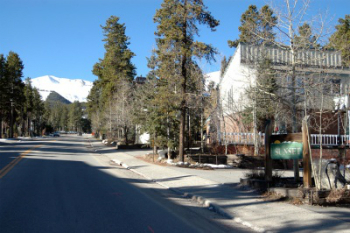 Find out more about living in this Breckenridge neighborhood, or start your search with the active Sunset condominium listings below. Built in the 1970’s these condos are space saving units, of various sizes and configurations, that general have bedrooms on the lower level and open living areas combining kitchen, dining and sitting areas in one space to accommodate any group of ski vacationers. Four O’clock run is obviously the main vein for access to and from the ski area, but is also was to take off on a hike in the summer. In addition to Four O’clock, several trails radiate in all direction from town, and make it easy to start a mountain bike or hiking excursion from any Sunset Condo for sale. Sq. Footage: 1447 sq. ft. to 1840 sq. ft.
From the traffic circle at the north side of Breckenridge continue on Highway 9 by following Park Avenue, and travel about 1.5 miles until reaching 4 O’clock Road. Turn right on 4 O’clock and Sunset Condo will be found on the right at 450 Four O’Clock Rd. Be sure to get in touch online or by calling us at (970) 453-2200 to have all of your Breckenridge real estate questions answered!